Continuing on with the "Love Through The Decades" series, today we head to the 1950's where Grease is TOTALLY the word! Did you guys ever have spirit days at school where you'd come dressed in different themes? Well my school totally did and 1950's day was always one of my FAVORITES (probably because I loved the movie "Grease" so much and always wanted to be like Sandy). So of course, naturally, I was SUPER excited about doing this 1950's shoot the most! When I first laid eyes on this Pink Ladies-esque dress, I instantly knew that it was going to be PERFECT for this shoot and paired it with some ankle socks, a fun patterned scarf, and the most deliciously pink retro sunglasses I had. 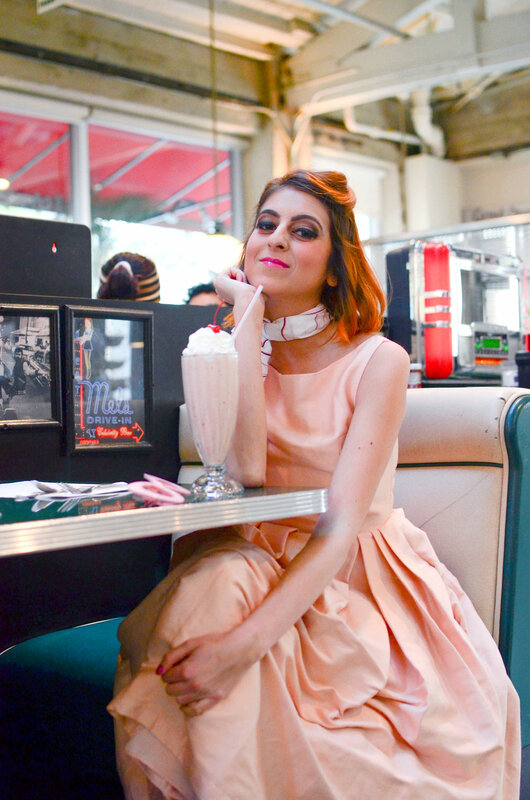 Putting together all the final elements to really recreate this era, I shot this at one of the most staple LA diners, Mel's Drive-In, which was totally like the cherry on top of this perfect (and beyond delicious) strawberry milkshake.